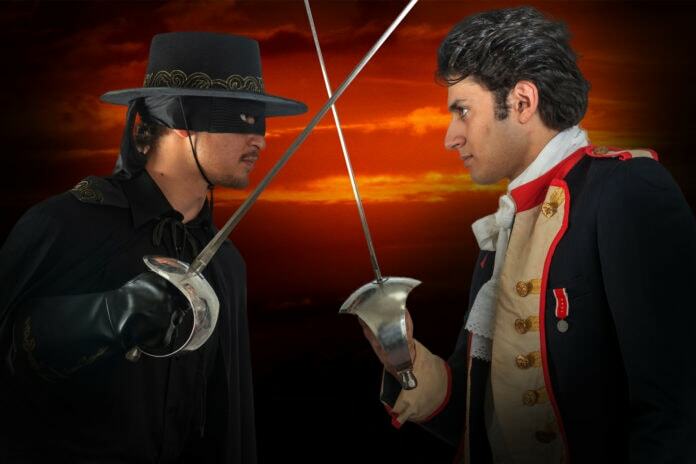 “ZORRO THE MUSICAL” opens at Artisan Center Theater April 12-May 11. The 196 seat theater-in-the-round is located at 444 East Pipeline Road in Hurst. Reserved seating tickets are $28 for adults, $26 for students and seniors, and $16 for children 12 and under. Tickets can be purchased online at ArtisanCT.com, or by calling the box office at 817-284-1200. This legendary story of good versus evil has been a source of enduring fascination. It also served as the subject of a best-selling novel by producer Isabel Allende and several major motion pictures. “Zorro the Musical” retells the dramatic tale of a romantic hero with spectacular sword-fighting and incredible magic. Set to the famous red-hot Gipsy King beat, “Zorro” is brought to the stage with the authentic colors of traditional flamenco. Books and lyrics for “Zorro the Musical” are by Stephen Clark, from original story by Stephen Clark and Helen Edmundson. Co-Composer and Adaptor is John Cameron. Artisan Center Theater’s production is directed by Natalie Burkhart, with choreography by Brittany Jenkins and Music direction by Richard Gwozdz. Cast members featured in “Zorro the Musical” are Diego De La Vega/Zorro – Josué Summers; Ramon De La Vega – Angel Somarriba; Inez – Gina Gwozdz, Courtney Mitchell; Luisa – Cynthia Zrna, Megan Guerra; and Sergeant Garcia – Luis Quezad. Also featured: John Coffey; Don Alejandro De La Vega/Old Gypsy – Mark Scott, David Magaña; Young Ramon/peasant child – Victor Ortiz, Jonathan Medlin; Young Diego/peasant child – Noah Johnson, Hayden Beaty; Young Luisa/peasant child – Graciela Herrador, Eva Magaña; Man 1/Gypsy/Zorro Double – Mason Vales; Man 2/Gypsy/Zorro Double – Jacob Hamilton; Man 3/Soldier/Barcelona Man – Stephen Jakubik, Daniel Lawson; Man 4/Soldier/Priest/Barcelona Man – Robert Shores, Andrew Villa; Man 5/Soldier/Gypsy/Zorro Double – David Carroll, Ian Nance; Man 6/Gypsy/Zorro Double – Benjamin Perkinson. Artisan Center Theater produces eight full scale Broadway style musicals in their 195-seat theater-in-the-round. Artisan also stages three additional plays on the 150-seat thrust stage located on Second Stage. Also on Second Stage, Artisan Children’s Theater produces six children’s shows each year where children perform for children. As part of their mission to create opportunities to experience uplifting family-friendly theater, Artisan offers a complete program of theatrical education, dance and performing arts classes throughout the year. Opening in 2003 and now serving more than 100,000 patrons each year, Artisan Center Theater is located at 444 E Pipeline Rd. in Hurst, Texas. The theater is closed on Sunday. For more information on Artisan visit ArtisanCT.com. Coming next to Artisan Main Stage is “Joseph and the Amazing Technicolor Dreamcoat,” May 24-June 29.